Collagen PLUS, Lida Forte Daidaihua Collagen PLUS with Hyaluronic Acid Collagen. Collagen is the natural proteinous component of the skin that maintains the shape of the body surface. It is the main building block for cartilage, bone, skin, lips, tendons, joints and other related organs and tissues. It is necessary for the maintenance of skin structure, firmness and elasticity. Collagen and elastin form the mesh network under the skin and hold the fat in its position. The body produces the enough amount of collagen, but its production is gradually declining due to the aging process. The rate of decline is almost double in women as compared to men and almost half of the total amount of collagen decrease by the age of 50 years in women. This Infographic further explains what is collagen. Collagen PLUS with sea algae is used in various types of inflammatory disorders like pruritic inflammatory skin disorder and rheumatoid arthritis. Sea algae helps in the reduction of inflammation that can cause a severe type of joint pain. It acts like a glucosamine in inflammation and decrease the onset of aches and pain. The clear mechanism of action of sea algae is not clear, but it proposed that it binds with lectins and forms the complex and then body remove this complex out of the body to reduce the inflammation. Sea algae also used in the prevention of various skin related protozoan and bacterial diseases because of its broad spectrum anti-infective property. 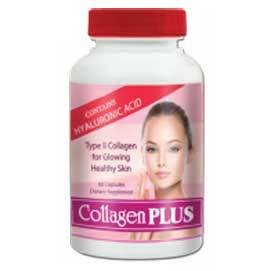 Collagen PLUS helps in the formation of tendons, ligaments, bones, cartilage, skin and muscles. In our body’s collagen acts as a thick thread of fabric and elastic acts as an elastic band that binds the fabric threads together and maintain the elasticity and smoothness of the skin and increase the skin strength. According to American Association of Oral and Maxillofacial Surgeons, combination of Hydroxyapatite with collagen increase the process of new bone formation. According to the report by researchers of Florida University, calcium and collagen combination fulfil the loss of bone minerals in the body and increase the rate of bone development. Currently viewing:Collagen PLUS with Hyaluronic Acid Collagen.